(English) What is Eject-command Japanese Users Group? To utilize CD-ROM drives that are no longer used ,we are making works using them. We use CD-ROM drives as actuation. Using their action, open and shut. Also, allowing operation from a remote location, we can remote control CD-ROM drive by using eject command which is available on any Linux. This user group is established by @Akkiesoft. 22 people has joined currently been on Google Groups at 4th October 2013. Constructing base portion of eject solution can be done in only 4 steps! Electronic works cannot immitate this easy way and foolish idea. You don’t need to design circuits and implementations not be needed either. It is not a programming or an assembler. You just write a little by the Lightweight Language you like. Prepare a CD-ROM drive and USB conversion cable. Unfortunately, CD-ROM drives take up spaces than we expected. You need to be generous with the fact that Spaces of your room will be reduced by them. Our publish source codes at GitHub: Sample scripts, Air-conditionar remote controlling script, etc. https://github.com/Akkiesoft/Eject-Command-Users-Group. We have mailing lists in Google Group. Click here to Join! We also have mixi community. Please feel free to participate. facebook is not available. Hash tag is #EJUG on Twitter. 4 Jun 2009: I was searching for how to reuse the CD-ROM drive. Then I found cdbiff, I was shocked and excited. Jun 2009: I did the presentation about hamster’s food feeder in OSC2009 Hokkaido. Jun 2011: I did the presentation about remote controlling for home electronics and USB in OSC2011 Hokkaido. Jul 2012: I did the presentation about us in LDD’12 / Summer in KITAMI. This is first of 40mins session. Aug 2012: I published the 「Dekiru! Eject-command handicraft (できる！Ejectコマンド工作)」 as DOJINSHI. Jul 2013: I and some people published “Raspberry Pi [Jitsuyou] Nyuumon (Raspberry Pi [実用] 入門)” from Gijutsu-Hyohron Co., Ltd.(技術評論社). I wrote Eject-command handicraft in AppendixB. 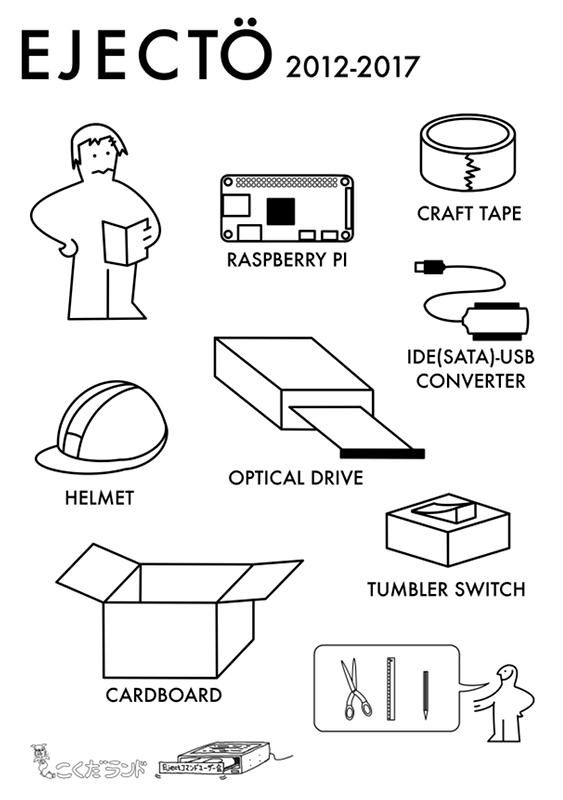 Sep 2013: We are introduced from Raspberry Pi official site.